Collected over twenty years of studying, teaching, and research, these problems range from gems taken from the classic literature to sticky issues we’ve seen in our own labs. 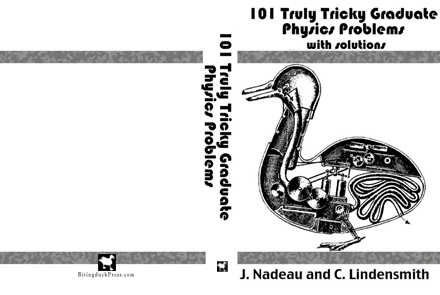 Divided into four sections–Classic Mechanics, Statistical & Thermal Physics, Mathematical Physics, and Quantum Mechanics– this book will be useful for graduate students studying for quals or anyone trying to refine their problem-solving skills. All of the problems are accompanied by full, detailed solutions. E-readers and distributors are not yet ready for MathML, but we offer you two options in the meantime! (2) Coming soon–iBooks author version for the iPad, from the Apple Store. One Response to “Available Now!